Millennium Falcon: Smugglers Run. This exciting interactive attraction puts you right behind the controls of the most famous ship in the galaxy! Get ready to blast off and check out the Disney teaser trailer. Star Wars: Rise of the Resistance. It’s the Resistance versus the First Order — and you’re right in the center of the epic battle. How cool is that?! It has been noted that this ride is opening later, after the initial park opening. Here’s a sneak peek of this motion-based dark ride from Disney. New Star Wars music. Even non-Star Wars fans recognize the saga’s epic music. There be exclusive new and original themes just for the land — created by Oscar-winning composer John Williams! The music was recorded by the London Symphony Orchestra at Abbey Road Studios. Check out the below video for a preview. Planet Batuu. This is new to Star Wars fans, which makes it all the more exciting and mysterious. According to the website, it’s “a remote outpost on the galaxy’s edge that was once a busy crossroads along the old sub-lightspeed trade routes.” Based on the construction video below, it’s shaping up to be one of the most massive and immersive lands yet! Black Spire Outpost. It was revealed early last summer that the name of the Star Wars: Galaxy’s Edge village would be Black Spire Outpost. According to the news release, Black Spire Outpost is the largest settlement on the planet Batuu and “an infamous stop for traders, adventurers, and smugglers traveling around the Outer Rim and Wild Space.” There’s sure to be lots of galactic adventures around every corner. Oga’s Cantina. Of course, any outpost needs a good cantina. It will feature themed music, characters, and drinks for both kids and adults — blue milk, anyone? This is the first time in history guests will be able to enjoy alcoholic beverages inside Disneyland (other than members-only Club 33). Visitors may also recognize RX-24, the former StarSpeeder 3000 pilot droid that once piloted the Star Tours ride in Tomorrowland, serving as the cantina’s DJ. Oga’s Cantina is the perfect spot for smugglers, bounty hunters, and locals alike to kick back and relax. Other out-of-this-galaxy food options. Ronto Roasters, Kat Saka’s Kettle and the Milk Stand will offer plenty of “indigenous and off-world flavors that are worth strapping the family in for a trip into hyperspace,” according to news releases from Disney. We can’t wait to quench our thirst with some of that legendary blue or green milk at the Milk Stand! Lightsabers and other fun stuff. We can’t wait to visit Savi’s Workshop for our own customized lightsabers and truly become one with the Force. You can choose from a variety of lightsaber themes and bring it to life with the power of kyber crytals. There’s also DokOndar’s Den of Antiquities, the Droid Depot where you can build your own droid, Toydarian Toymaker for toys and collectibles, and so much more. There’s a lot to still be released about this immersive experience and we can’t wait to hear and see more. Keep checking back because we’ll be sharing more details as they arise. We’ll see you on Planet Batuu! Headed to Anaheim, CA to check out this exciting new land? 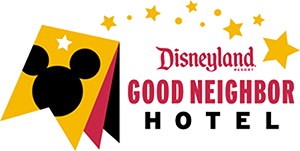 We’d love for you to be our guest. 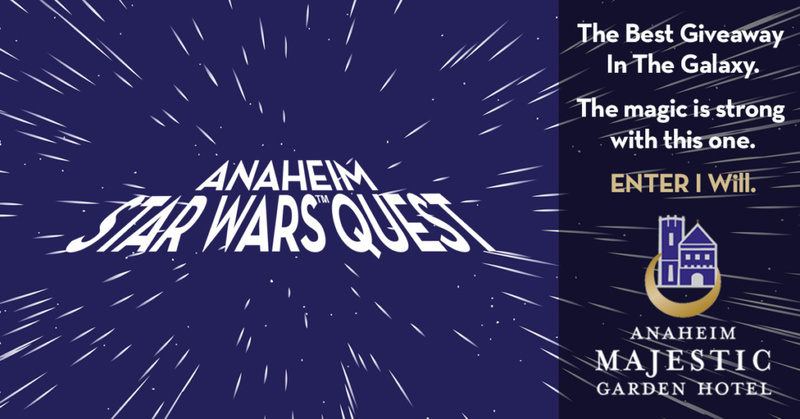 Learn more about how Anaheim Majestic Garden Hotel can take your Star Wars experience to the next level and enter to win our Anaheim Star Wars Quest — the Best Giveaway in the Galaxy through May 7th!